Feds Launch App Contest For Facebook 'Lifelines' : Shots - Health News The idea is to make it easy for Facebook users to beef up their own preparedness and strengthen their social connections in case something goes really wrong, such as a pandemic or serious earthquake. People check their smartphones while standing in the street shortly after an earthquake struck Washington on Tuesday. 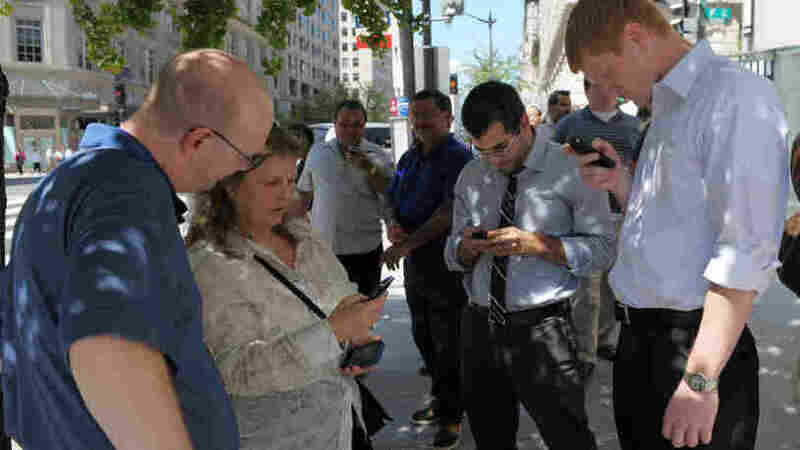 The first thing East Coasters did when the ground began to shake this afternoon wasn't duck under their desks, but to turn to their smartphones. The 5.8 magnitude earthquake that was felt from Durham, N.C., to Toronto was documented instantly through social media like Facebook and Twitter. And that's just the sort of reaction Stacy Elmer expected. She's a special assistant to the Assistant Secretary for Preparedness and Response, a division of the department of Health and Human Services, created in the wake of Hurricane Katrina. And just yesterday, ASPR launched Elmer's idea: the Lifeline Facebook App Challenge, a contest for developers to help people prepare for the worst in a health emergency. The idea is to make it easy for Facebook users to beef up their own preparedness and strengthen their social connections in case something goes really wrong, such as a pandemic or earthquake. The competition will run till the end of hurricane season on Nov. 4. No word on what a Facebook public health application might look like, but the ideal, according to the HHS website, would include a method for users to identify three people as "lifelines" or emergency contacts. It would also create and share personal preparedness plans, be mobile-device ready, and incorporate a Geographic Information System (GIS) for locating or "tagging." No mention of batteries or bottled water. Elmer noticed that during the aftermath of recent disasters, people were turning more to websites like Facebook rather than calling people on their cellphones. "I thought about how we can leverage that kind of behavior," she said in an interview before the quake. The idea is to reduce pressure on jammed phone lines, since people would use social media sites to reconnect in the event of an emergency. The HHS Assistant Secretary for ASPR, Dr. Nicole Lurie, said the competition is way for the department to take advantage of emerging social media. "One of the things that is fundamental to a community's resilience is its connections between people," she said. "In the end it's going to be friends and neighbors who are going to help each other out in an emergency situation." The CDC still recommends an emergency pack and evacuation plan for earthquakes to zombie attacks, but the addition of a social media-based tool can be a more human approach, according to Elmer.